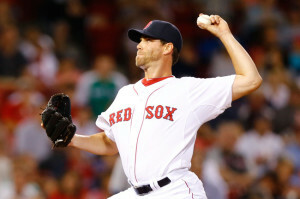 The Boston Red Sox have placed reliever Matt Thornton on the 15 day disabled list with an oblique strain. Thorton was acquired from the Chicago White Sox after losing left-hander Andrew Miller for the rest of the season, and has made 10 appearances for Boston, giving up two runs on 12 hits over 8 1/3 innings with two walks and six strikeouts. In 50 total appearances this year, he has a 3.47 ERA, holding left-handed hitters to a .221 average. The Red Sox have recalled Pedro Beato has been recalled from Triple-A to take his place in the bullpen.